Canon said digital camera volume will drop by about half in a couple of years. That's about what the top gray line shows (doesn't quite reach half in my predictions). That line is the total camera volume, and is driven downward most by the blue line, which is compact camera sales, and a bit less by the orange line, which is DSLRs. Meanwhile, Sony has said that ILC will drop only by about 20%. That's the red line (orange and green lines taken together). The orange DSLR line drops faster than the mirrorless green line grows, which creates a slow overall drop in ILC. Fujifilm says there's opportunity for them to grow. Well, that's the green mirrorless line, which indeed shows modest growth over time. Whether Fujifilm can grab that share from others now that everyone is playing in the mirrorless pond is another story. So what's the purple line at the bottom? That's full frame (both DSLR and mirrorless). You can see why the big players want to be in that market: it's not the largest volume, but it's not likely to contract, and it also contains units selling at high prices. Thus, if you can get a chunk of that market and hold it, you have some stability to your financial numbers. Moreover, note the line slopes: purple (full frame) will probably overtake orange (DSLRs) at some point in the more distant future. Now you know why Nikon and Sony have been concentrating on full frame in the recent past, and why Canon's and Nikon's latest full frame offerings have been mirrorless (Sony previously made that move). Note that the 2018 numbers in this chart are based off of real data. The 2019 thru 2021 numbers are a reasonable prediction based off of past and current data trends. Obviously, as predictions they may be off. I'd bet they're within 10%, though, as the model I've been using to do these predictions is wobbly, but not generally far wrong. This chart also answers another question that keeps coming up: are APS-C and other crop sensor cameras dead? Absolutely not. You'd have to predict hugely dramatic growth of full frame unit volume for crop sensors to go away in ILC. 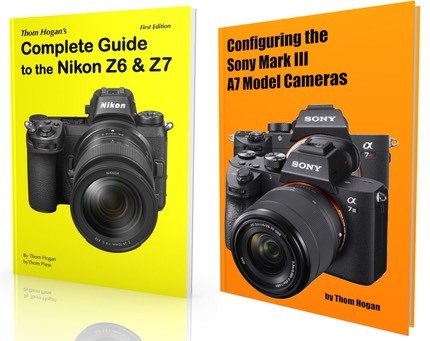 So, all the Japanese executives that have been talking about the state of the camera market can be right, even though at first glance it might look they're contradicting each other. It's just that they're each looking at the market a slightly different way. Canon, as the dominate camera producer across all types, has to look at the market broadly (gray line). Fujifilm, mostly because of their APS-C mirrorless models, looks at the market more narrowly (green line).